Wedding season is in full swing here at V. Sattui Winery, and we are loving every minute of it! Here are some of our favorite shots from May 19th, 2018…congratulations to Mr. and Mrs. Lawson! We are so happy for this beautiful couple. Special thanks to photographer extraordinaire Jen Philips for these gorgeous images. Wedding season is nearly upon us, and we couldn’t be more excited! Here is a look back at one of our favorite weddings from November 2016…congratulations Lauren & Chance! Thanks to photographer Ken Viale for these magical shots. VSW weddings are magical, whether by the warmth of the sun or the glow of the moon. This Wedding Wednesday we are featuring the beautiful daytime elopement wedding of Craig & Marsha! These two lovebirds tied the knot on our Vittorio’s Terrace overlooking the vineyard in mid-October. Thanks to master photographer Ken Viale for capturing these wonderful shots! V. Sattui Winery Weddings – A tour of Napa Valley! Location, location, location! One of the most exciting aspects of a V. Sattui wedding is the ability to select which spots around property will be featured. Couples fall in love with our fountain, courtyard, tower lawn, Vittorio’s terrace, barrel cellar, and vineyard spaces. With this many different locations in one venue, guests feel like they’ve experienced a tour of Napa Valley by the end of the evening, without ever leaving the winery! Kylie & Max – A Wedding to Remember! As Summer comes to an end, what better way to remember the fun times than to look back at one of our favorite Summer 2016 weddings? We were lucky enough to host the beautiful wedding of Kylie & Max back in June, and couldn’t resist sharing these gorgeous photos from talented photographer T.J. Salsman. Hope you like them as much as we do! Riding off into the Sunset…V. Sattui Style! What’s a fairy tale without a magical ending? While we like riding horses, we’re more excited about these fun methods of transportation! This couple appreciates hard work! Putting in some time on the tractor before the sun goes down and the party starts. A classic car for a modern couple, their love will never go out of style! We love these edgy vineyard shots! This couple isn’t afraid to show their wild side. This couples love brings new life to V. Sattui’s old faithful. This couple is on the right track to a wonderful life together! What other unique methods of transportation have you seen at weddings? We love these personal touches! Love is Sweet at V. Sattui Wine Country Weddings! Love is sweet, and so is dessert! Every couples love is unique, and we think their weddings should be no exception. From the decorations to the music, and of course, the treats! We love to see our wedding couples personalities and tastes shine through, and are always curious to see what scrumptious dessert they select for their big day. Multiple smaller cakes not only provide eye appeal on an attractive dessert bar, they offer more variety for your guests. The more flavors the merrier! Tiered cakes are truly elegant, and truly customizable! We love this simply sweet design, and fell hard for the romantic topper. Who needs a cake when each guest can have their very own monogrammed cupcake? We think these whimsical treats are the bee’s knees! These artfully displayed donuts are a unique sweet treat sure to please guests of all ages. We’ve got our eye on the maple bars! This adorable display has it all! A cake on top for cutting, a romantic topper, and mini cinnamon buns complete with icing. This breakfast treat was just as delicious after dinner! What unique wedding sweets have had your mouth watering? Wedding season is definitely in full swing! We’ve been having so much fun working with all the brides and grooms to help them pull off their dream-wedding. All of them have been so special, and we want to share some with you! Here’s a little inside-view of Nick and Marie’s wedding a few weeks ago! Thanks to Colson Griffith Photography for sharing these photos with us! It rained all day prior to their evening nuptials, but the sun came out just before the ceremony began. I think that stroke of luck means good things for their future, and definitely led to some awesome photos! One of the most fun parts of each wedding is meeting the family. This little ring bearer was such a cutie! Big thanks to Marie and Nick for letting us be a part of your special day! We wish you the best of luck, cheers! Call it sappy, but here at V. Sattui we just love love! We can’t help it, we’re hopeless romantics! There’s nothing sweeter than the happiness between two love birds joining their lives together, and we’re lucky to get to witness it so often. We’ve seen so many beautiful and romantic moments, and we want to share them with you! Here are some of our favorites. How perfect is it that her bouquet matches the colors of the sunset? This couple didn’t let a little rain spoil their night! They can tough out any storm together. We loved this couple’s private little dance within the vineyard. So romantic! Peek-a-boo! This veiled kiss is just the cutest. Sometimes you just need a moment away from the hustle and bustle of the wedding to enjoy each other’s company. The barrels are such a fun backdrop for this stolen moment! Napa Valley Summer Weddings – Warm Days and Warm Hearts! Summer is right around the corner, and we’re loving all this warm weather we’ve been having! One of the reasons this sunshine is so great is because it opens up a lot of opportunities for some gorgeous outdoor weddings. Take a peek here at some of our favorite set ups! Special thanks to photographer Alexander Rubin for helping us capture them! Nothing says sunshine quite like yellow! We love the playfulness of this hombre flower-petal aisle, especially in contrast to the sophisticated wrought-iron chairs. Lawn weddings are quintessentially summery, and the sunflowers with pops of red make this wedding whimsical and fun! The mix-matched ultra-comfy seats are a casual and unique twist too. Vineyards are the perfect backdrop to a rustic, country-themed wedding, and we this set up is the perfect match for that! Our favorite part is the red truck, which is actually a cooler! That truck puts the “fun” in functional! One of the best things about summer is the warm summer nights! Twinkling lights in the dark are so romantic, so we’re happy it’s warm enough to stay outside and enjoy them! With wine making and wedding planning, one thing is always true: It’s all about the details! Both making wine and planning a wedding are such fun creative processes, and we love seeing how brides and grooms find fun and unique ways to incorporate their winery wedding location into the theme of their wedding! Here are some of our favorite wine country wedding ideas we’ve seen! Big thanks to photographer Ken Viale for capturing these images for us! Let’s be honest, how often do wedded couples go back and read the guest book signed at their wedding? Having a signed large-format wedding bottle on display not only looks a lot more fun, but gives you a token to enjoy for years to come! We love the idea of a wine ceremony – blending a red and a white wine together – as a creative way to symbolize two people coming together as one. It’s fun, romantic, and tastes pretty good too! There are so many fun and creative ways to use corks within your wedding! Some of our personal favorites have been using them as place holders and as ring holders! Wine makes the prettiest backdrop! Whether it be barrels or bottles, wine always photographs well! April Showers Bring May Flowers to Weddings in Wine Country! Love isn’t the only thing in bloom this time of year! Here at V. Sattui we’re not only surrounded by our lush and beautiful gardens, but by the many stunning flower arrangements we see at all of our weddings! To celebrate spring and all the beauty it brings, we wanted to highlight some of our favorite wedding florals. Big thanks to photographer Shannon Stellmacher for preserving these flowers with your photos! White is a timelessly classic look, and we love how these white flowers add a little pop of life to this elegant table setting. For those who prefer color, why not opt for mismatched bouquets? If traditional isn’t really your thing, we love the mostly green bouquets we’ve been seeing lately. It’s a fun way to add a trendy and natural touch to your look! Flowers aren’t just for bouquets! We love the way this couple used flowers as an aisle and a back drop. Vineyards and wineries have long evoked notions of romance. Their rustic, vintage charm and earthy atmosphere create a magical setting unlike any other. It’s no surprise that an increasing number of brides-to-be are jumping on the winery wedding bandwagon these days, especially in California. Here at V. Sattui, we’re proud to share our beautiful landscape with our brides and grooms, and are thrilled to help make their special day extra beautiful. We love every aspect of the weddings we host here in wine country, but we’ll narrow it down here to our top 5 favorite reasons! Also, special thanks to photographers Richard Wood and Ken Viale for capturing these moments! Between the lush green leaves of spring and summer, the spectacular crimson and gold leaves of fall, and the delicate cover crop flowers of winter, our vineyards serve as a stunning backdrop during every season! The rustic atmosphere of a winery takes you back in time to simpler days, and evokes a cozy, intimate feeling. What’s a wedding without beautiful flowers, right? Here at V. Sattui, our natural landscape perfectly complements beautifully crafted floral arrangements. Everyone looks forward to sipping on something delicious at a wedding, and winery weddings definitely cater to that need! In a time when the “farm to table” trend is so popular, why not carry it through with “vineyard to glass”? It’s fun to tie in decorations and party favors with the theme of the venue! Spring Weddings Are In The Air at V. Sattui! We can hardly contain ourselves as our spring weddings are right around the corner! A huge thank you to photographers: Ken Viale, Richard Wood, and Marie A Rummel, for sharing the images below. Their artful eyes capture the magic of these unforgettable moments! Spring in Napa Valley is one of the most beautiful times of the year. You’ll find pretty yellows, greens, pink and classic ivories –all of which make us want to exclaim “I do”! The combination of new buds in bloom and clean, fresh air also makes taking photos a breeze. Add in Napa Valley’s golden sunsets, and you see why V. Sattui is the perfect destination for blissful beginnings. Ooh, and the breeze carries the aromas of our fresh lavender ! All the more reason to sneak one last kiss before the ceremony. But, nothing shines as bright as the smiles and lightheartedness of bridesmaids who are giddy from the aromas of fresh roses. In April we get to reunite with our favorite Michelin-star Italian chef, Stefano Masanti, and his beautiful partner in life, and in all things gourmet, Raffa! From April into November they will create unforgettable wedding receptions at V. Sattui including Stefano’s creative, delicious cuisine and Raffa’s attention to every detail in the service and decoration of each couples’ dream day. C’mon Spring Fever! We are ready! 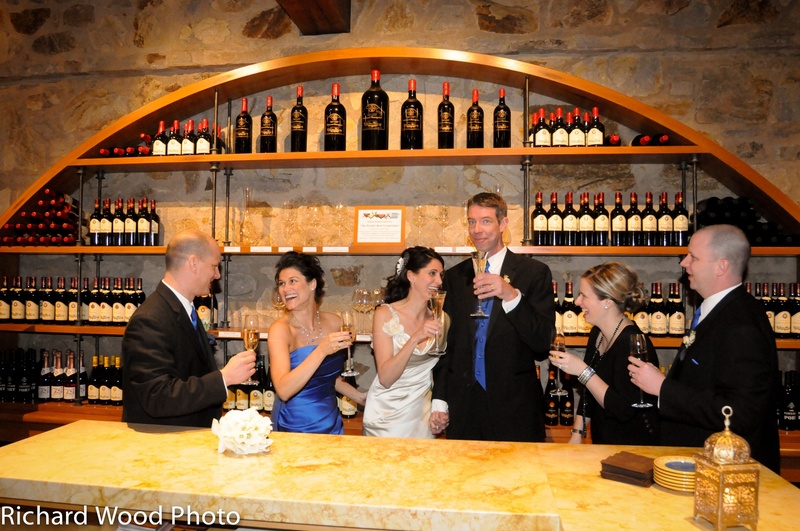 Have any spring V. Sattui wedding moments you’d like to share? We’d love to hear from you!